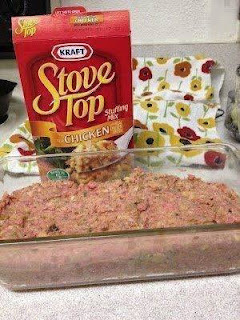 Meatloa With Stove Top Stuffing. I have made this a couple of times now, and it turns out perfect every time. I love that it doesn't require guesswork! The consistency is always perfect, and thanks to the spices in the stuffing mix, it tastes delicious. We had this last night with roasted broccoli and corn on the cob, and it was perfect!